It looks like Utah's first strip coal mine will become a reality. Alton Coal Development handed Gov. Gary Herbert a $10,000 campaign check and a permit for this mine was quickly handed back in return.The mine is 10 miles from Bryce Canyon National Park, a critical destination for tourists coming to our state. Tourists enjoy southern Utah's "breathtaking" vistas, not air pollution. They don't come to Utah to see strip mines, dust from the strip mines, or to enjoy the noise and diesel emissions from trucks and heavy equipment. Can you imagine a coal strip mine near the beaches of Hawaii, at the base of the Matterhorn, the edge of Yosemite? Bryce Canyon is a unique, world-class natural wonder. People come to be awestruck by the beauty, the clear skies and clean air, not the wreckage of industrialization such as this mine.Neither will tourists appreciate dodging 400 enormous coal trucks on a narrow two-lane highway in order to reach Bryce Canyon. Tourism to Bryce Canyon brings millions of dollars of revenue to the state, county and area towns. Even if this mine brings some much-needed local employment, the salaries paid will not come close to equaling the monetary loss from the drop in tourism because of poor road conditions, traffic and air quality. Concerns about air quality have been voiced by Bryce Canyon National Park's acting superintendent, the district ranger for Dixie National Forest, and many citizens and groups throughout Utah.Approximately 400 trucks will be traversing Highway 89 (National Mormon Heritage Highway) to Highway 20/ I-15 to Delta. During bad weather these trucks will be traveling up Highway 89 to I-70 and on to Delta. This will impact even more small towns in the area: 400 trucks, 24 hours a day, six days a week.PM10 emissions from this mine will be 100 tons a year and the Utah Division of Air Quality is not even addressing PM 2.5, a much more toxic air pollutant. Pollution and fine coal dust (PM 2.5) will be emitted from the coal trucks, causing serious health threats. Another alarming fact: No air-quality monitoring will be done along the transportation route. DAQ says it has no money to spend protecting our clean air (guess it all went to the $13 million highway bid settlement).During a public hearing held in Panguitch Oct. 6, DAQ admitted it would not install air-monitoring stations at the site to check air quality and visibility as, again, there are no funds. However, Alton Coal "volunteered" to put in two air-monitoring stations. When DAQ was asked who would be checking these stations and reporting the findings to DAQ, it admitted the coal company would be doing the monitoring. Is this "the fox guarding the hen house" or what? How can US 89 handle this increase in traffic? What will it do to the road conditions? Studies in other states have demonstrated that heavy coal trucks (these will be double tandem, hauling 40,000 pounds of coal) take a huge toll on road maintenance that the taxpayers, not the coal companies, end up paying for. This increase in road maintenance will need to be done in the summer, further diminishing tourism and hurting related businesses.An antiquated, dirty, primitive way of mining coal is being permitted within a short distance of a Class 1 national park. With demand slowing and the cost of coal dropping, with mines like the one in Emery that shut down last week and will lay off 160-plus workers in December, and with an excess of coal stockpiling, why is Herbert pushing the Division of Oil, Gas and Mining, Department of Environmental Quality and DAQ to permit this mine? 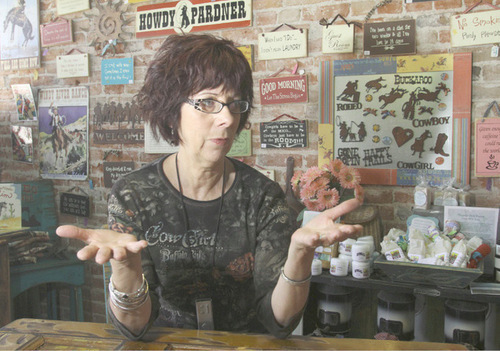 One wonders, could $10,000 have helped make that decision?Bobbi Bryant is a business owner in Panguitch.